This chapter is a synthesis of new knowledge, procedures, best practices and references for collecting plant diversity since the publication of the 1995 volume Collecting Plant Diversity; Technical Guidelines, edited by Luigi Guarino, V. Ramanatha Rao and Robert Reid, and published by CAB International on behalf of the International Plant Genetic Resources Institute (IPGRI) (now Bioversity International), the Food and Agriculture Organization of the United Nations (FAO), the World Conservation Union (IUCN) and the United Nations Environment Programme (UNEP). The original text for Chapter 18: Collecting Plant Genetic Resources and Documenting Associated Indigenous Knowledge in the Field: A Participatory Approach, authored by L. Guarino and E. Friis-Hansen, has been made available online courtesy of CABI. The 2011 update of the Technical Guidelines, edited by L. Guarino, V. Ramanatha Rao and E. Goldberg, has been made available courtesy of Bioversity International. Over the past 15 years, there has been a paradigm shift in participatory approaches to collecting traditional knowledge associated with plant genetic resources from extracting knowledge for a scientist to use to a focus on how local communities can benefit from involvement with scientists. This reflects an increasing recognition of the fundamental role that farmers continue to play in generating and maintaining the diversity of landraces. During this period, the plant genetic resource community has shifted emerging recognition of the value of traditional knowledge to general acceptance that a comprehensive approach, such as the methodology of a traditional knowledge journal (TKJ) is needed. This methodology shifts the control of the documentation from the scientist to the community itself. 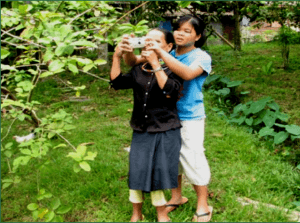 Before collecting ethnobotanical data, scientists play a role in empowering farmers and communities to document their knowledge by themselves. Then, the scientists seek permission to jointly use the knowledge documented. Prior informed consent and material transfer agreements are now an inherent part of ethnobotanical data collecting. The role of ex situ and in situ conservation has taken a new direction with an increased understanding of the links between local culture and the conservation of plants by the community. The 1995 version of this chapter provided an introduction to participatory techniques for collecting the indigenous (traditional) knowledge associated with plant genetic resources. In the mid-1990s the use of social science methods in the plant genetic conservation community was a novelty, and the 1995 chapter provided an overview of the two methodologies widely known at the time – rapid rural appraisal (RRA) and participatory rural appraisal (PRA) – and how these participatory techniques could be used in the “memory banking approach” (Sandoval 1994) to document indigenous knowledge as part of genetic resource conservation. The 1995 chapter discussed more informant-led approaches to collecting indigenous knowledge about plant genetic resources, including the use of local gatekeepers and cognitive mapping of landraces. Since 1995, participatory approaches have become the mainstream in most aspects of development assistance (for an overview see Friis-Hansen and Kyed 2009). There has been an overall shift from using participation in an instrumental way (to involve the community and extract knowledge in ways defined by external actors) to using participation as part of the community-empowerment process, often in conjunction with more instrumental approaches. Participatory methods for documenting traditional knowledge for plant genetic resources has also shifted direction – from the extraction of knowledge for the use of scientists to a focus on how local communities can benefit from involvement with the scientists. The methodology of a traditional knowledge journal (TKJ) addresses documentation needs at the community level and facilitates its use by scientists. TKJ has been supported by Bioversity International over the last decade; however, this support has mostly been at project conferences. The approach has not yet become an integrated part of the collection of plant genetic resources. The process of documenting the traditional knowledge of communities about plant genetic resources can be perceived as exploitation when communities do not benefit from it. The main issues include language, recognition and protection (Quek et al. 2009). From the community’s perspective, the data collected and the papers produced are in the scientist’s language, so the content is not available to the community. When scientists finish their work, there are usually no funds provided for any translation to benefit the community, and the community loses the possibility of complementing their indigenous knowledge with the scientific knowledge. For the scientists, the knowledge they have captured is in a translated or filtered form and makes reinterpretation difficult, and the original source of the knowledge might no longer be available. In addition, there is no recognition of the farmer as the source of the knowledge. Before scientists can use the knowledge of communities that have oral traditions, they need to assist the community in documenting this knowledge in their own language for their own use. Then the community’s knowledge may only be used with a citation. This process avoids the one-sided approach where traditional knowledge (TK) is studied without any benefit to the community. The TKJ methodology was developed on the premise that farmers and community members have knowledge that is valid for scientific use and that empowering farmers to do their own documentation addresses the problem of knowledge erosion and enables scientists to have access to the information. This methodology was first proposed by Quek and Zhang (1997) and has since been developed further and used by several organizations in the Asian region. Figures 18.1 and 18.2 illustrate the methodology, which was also described by Padulosi et al. (2002). The process starts with the scientist helping the farmer to develop a paper that is authored by the farmer and acknowledges the scientist’s assistance. The scientist then develops his or her interpreted version of the paper or collects the ethnobotanical data and cites the farmer’s paper after obtaining permission to use it. The farmer’s paper can be in any format –from paper for those who can write to audio and video tapes. Having the farmers’ knowledge documented in their own language enables communities to reuse their traditional knowledge in a manner that is similar to the way scientific communities reuse their knowledge. The farmer is recognized as the author of the paper because the scientist and others will cite it as the source of the information. This allows cultural and social information to become available to be validated by the community for reuse; other farmers can react as well. Knowledge captured in the farmer’s paper is the original source and therefore can be reinterpreted by different scientists if the community allows. This makes reinterpretation of the knowledge possible as science progresses. The question one might ask is why we should be concerned about the traditional knowledge of the community when what we are really interested in is data for the conservation of the materials. The answer is that an understanding of the community’s knowledge will provide an understanding of the conservation of plant genetic resources in situ. At the subsistence level, where most farmers are illiterate, their knowledge is usually passed on by word of mouth. Traditional groups of people have devised different methods of preserving their knowledge by embedding it in folklore, songs and sayings, as well as in their cultural arts and practices. In the process, one can expect the information to change along the way as some information will undoubtedly be omitted or added. Thus, any documentation has to take into account the possibility of such changes over time. The knowledge is lost when the knowledge holder passes away. The knowledge becomes threatened if there are no recipients for it (e.g., the younger generation is no longer interested). The knowledge becomes unwanted (e.g., when it is easier to access commercial drugs than herbs). The knowledge becomes just a story when the plants and/or materials used are no longer available (e.g., when they become extinct). Empowering communities to document their knowledge helps to promote in situ conservation because they then become more interested in maintaining their plant genetic resources. It also validates their knowledge and helps to promote the sharing of knowledge among the community, especially among the youth and children (Naming et al. 2010). It is extremely important to think about the process prior to community participation. The experiences described here are based on work carried out by the Yunnan Academy of Agricultural Sciences (YAAS) (Dai et al. 2008), the Kyanika Adult Women’s Group (KAWG), the Sarawak Biodiversity Centre (SBC) and the Platform for Agrobiodiversity Research-Climate Change (PAR-CC) project. SBC has 10 years of experience in implementing the TKJ methodology, and they have developed a framework (figure 18.3) that is workable and well received by the ethnic communities (Naming et al. 2010; Tu et al. 2010). For the long term, it is good to have communities develop their own vision and mission statements for their reasons for conserving their knowledge. A form for prior informed consent (PIC) will need to be signed by both the community and the scientist. A sample PIC, which was used by PAR-CC, is shown in the box below. It conforms to the code of ethics of the International Society of Ethnobiology (see http://ethnobiology.net/code-of-ethics). The community should start by making an inventory of plants. It is important to have the list of plants validated by the community in order to clarify names (e.g., a plant can be known by more than one name and, in some cases, a name might be used for more than one plant). To assist in the validation process, members of the community are taught how to make herbarium specimens, which are useful during the documentation process because they provide a framework for the expert to talk on. Experts on various plants are identified by the community, based on the inventory. Oral documentation can be made on simple tape recorders and video recorders. 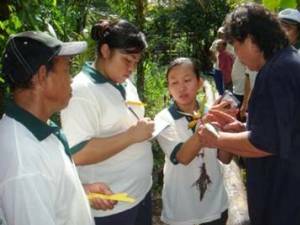 With the plant specimen in front of the expert, he or she is asked, “What do you want to tell your grandchildren about this plant?” This process allows the community to document their knowledge in a way they are comfortable with. It also facilitates recall and helps ensure the completeness of the knowledge recorded. The community is encouraged to develop their own ethnobotanical garden so that the children can use the tapes to learn about the useful plants and to maintain knowledge within the community. The process helps to ensure that the knowledge is at least conserved within the community and that it will be available for sharing when the community is ready to share. It also allows the knowledge to evolve over time. In communities where herbalists might claim that their knowledge is a secret, it is still important to emphasize that they should document the knowledge and keep it so that at their death, the knowledge can still be handed over to whoever they have chosen. Otherwise, the cliché “a library is burnt when an elder passes away” becomes a reality. This gives the community ownership of the knowledge documented; they even have the right to deny the scientists permission to access the knowledge. The TKJ methodology may seem to put a hurdle before the scientist collecting ethnobotanical data. The need to assist the community in documenting their traditional knowledge might seem to make their job harder, and the significant increase in cost in terms of both human and financial resources is likely to be the main challenge for widespread use of the TKJ methodology. In the long run, however, once the community has documented their knowledge, then collecting ethnobotanical data becomes similar to conducting a literature review on the plant concerned. Any missing information can be discussed with the knowledge holder, building up the knowledge within the community at the same time. The process reduces knowledge erosion, and the merging of traditional and scientific knowledge into a common citation system can be realized. This not only provides recognition of the knowledge holder but also empowers the community. With the documentation system in place, the community will need tools to manage the knowledge it wishes to share. We need to find ways of using information technology to assist the community in creating a database of traditional knowledge. Access and benefit sharing is a gap that we need to close so that communities feel comfortable with the sharing process. At present only the material transfer agreement (MTA) of the International Treaty on Plant Genetic Resources for Food and Agriculture is available, but a simple model is needed – one that is understandable and implementable by the community. “Research staff” has the meaning of any staff working for or under the instruction of the research organization. “Community” is any member of the <> who holds knowledge and who shares his/her knowledge. 1. Research staff will abide by the traditional practices in the community with respect to knowledge sharing and documentation of the shared knowledge. 2. RO understands that the community does not sell its knowledge. 3. Any payment made to a community member is not payment for the knowledge but payment for opportunity wages lost. 4. The community knowledge that is collected is meant as sharing from the community, and the Community reserves the right to reject or restrict the publishing of information and knowledge that are part of their culture and/or maintained by custodians/holders and/or as in their traditional practices. 5. RO will lodge with the community a copy of all publications that are made using the collected knowledge. 6. Knowledge used in publications must bear the community name in a citation and not just as an acknowledgement. 7. All traditional knowledge (TK), especially innovations and practices, is the intellectual property of the community and its use for noncommercial research is allowed with proper citation. 8. For commercial use of the TK as a result of future research, the consent of the community must be sought first and the community should be compensated (based on negotiations), along with written agreement as to citations that can be traced to the research concerned. 9. RO will share scientific knowledge with the community and maintain the integrity of the community’s knowledge system. <<Community representative>> hereby grants consent to <<Research Organization>> to carry out their research in the community for this project from <<date>> to <<date>>. There is also concern about the loss of traditional knowledge as a result of changing lifestyles, changing priorities, the availability of modern amenities and diminishing dependence on natural resources among indigenous communities (Manurung et al. 2010). An additional concern is rural-urban migration, which poses challenges for communities with closed cultural links to their plants. Moving away from their communities risks the loss of their traditional varieties, especially heirloom varieties, as their culture erodes. Based on the PAR-CC project in Sarawak, where heirloom varieties of rice are maintained by households, based on their culture, there is a need to find ways to allow households to conserve their heirloom seeds longer than they do with traditional methods so that they can move to urban areas for short periods to be with their children and then return to continue their rice-growing culture. It is also possible that genebanks could provide a form of “seed hotel” service so that unclaimed heirloom varieties could be integrated into the national collection, especially for heirloom varieties not shared outside the family. Issues of knowledge ownership need to be addressed because members of the community might claim individual ownership for knowledge not known to others in the community. This will have an impact on future access and benefit sharing and will need to be resolved to ensure knowledge ownership by the community. National programmes around plant genetic resources should be stimulated to use the TKJ as an integrated part of their collecting methodology. 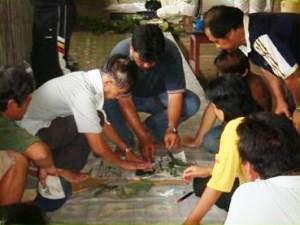 Experience with attempts to use participatory approaches to collection of local knowledge, such as TKJ, in connection with collection missions, should be evaluated. The TKJ methodology actually prepares the community before the germplasm collection begins and facilitates the use of PRA tools and other assessment methods familiar to scientists. Within the past decade and a half, the plant genetic resource community has moved from accepting traditional knowledge as a valuable source of information, to embracing the TKJ methodology, which places control over the knowledge is compiled and access to it in the hands of the community rather than the scientist. 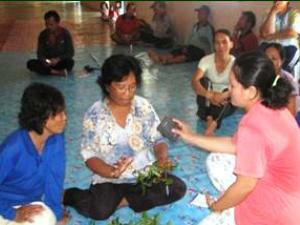 The TKJ methodology addresses the need for documentation at the community level and facilitates its use by scientists. It is a step that comes before the scientist’s use of the knowledge and allows the information to be cited. Communities involved in such work will also be involved in conservation at the community level, which will reduce knowledge erosion and facilitate future access to valuable information about plant genetic resources. Ceccarelli S, Guimarães EP, Weltizien E, editors. 2009. Plant Breeding and Farmer Participation. Food and Agriculture Organization of the United Nations, Rome. Dai L, Chengli You, Quek P. 2008. Indigenous Knowledge and Agro-Biodiversity. China Science Press, Beijing. Friis-Hansen E, Bhuwon S, editors. 2000. Participatory Approaches to the Conservation and Use of Plant Genetic Resources. International Plant Genetic Resource Institute, Rome. Friis-Hansen E, Kyed MH. 2009. Participation, Decentralization and Human Rights: A Review of Approaches for Strengthening Voice and Accountability in Local Governance. Social Development Department, the World Bank, Washington DC. Manurung R, Naming M, Tu CL. 2010. Traditional knowledge of genetic resources: its documentation and conservation. In: Mirfat AHS, Salma I, Mohd Rani MY, Mohd Norowi H, Mohd Shukri MA, Erny Sabrina MN, Noor Sarinah MN, Siti Noor Aishikin AH, Nor Asiah I, editors. Second National Conference on Agrobiodiversity Conservation and Sustainable Utilization, Agrobidiversity for Sustainable Economic Development. Malaysian Agricultural Research and Development Institute (MARDI), Malaysia. pp.53. Naming M, Yu RA, Tu CL. 2010. Traditional knowledge conservation and transmission of agrobiodiversity: sharing of experiences by the Penan community in Mulu Sarawak. In: Mirfat AHS, Salma I, Mohd Rani MY, Mohd Norowi H, Mohd Shukri MA, Erny Sabrina MN, Noor Sarinah MN, Siti Noor Aishikin AH, Nor Asiah I, editors. Second National Conference on Agrobiodiversity Conservation and Sustainable Utilization, Agrobidiversity for Sustainable Economic Development. Malaysian Agricultural Research and Development Institute (MARDI), Malaysia. pp.54. Padulosi S, Leaman D, Quek P. 2002. Challenges and opportunities in enhancing the conservation and use of medicinal and aromatic plants. Journal of Herbs, Spices and Medicinal Plants 9(4): 243–267. And in: Johnson CB, Franz C, editors. Breeding Research on Aromatic and Medicinal Plants. The Haworth Herbal Press, Abingdon, UK. pp.243-267. Quek P, Lim ES. 2008. Possible approaches for protection and sharing of traditional knowledge for Malaysia communities. In: Mohd. Shukor Nordin, Salma Idris, Mohd. Said Saad, editors. Agrobiodiversity in Malaysia. Malaysian Agricultural Research and Development Institute (MARDI), Malaysia. pp.141–149. Quek P, Zhang Z. 1997. Documenting indigenous knowledge: the need for an IK journal. IPGRI-APO Newsletter No.23, August. Quek P, Manurung R, Naming M, Kimonyi JM, Dai L, Abraham M, Eyzaguirre P, Morimoto Y, Maundu P, Zhang Z. 2009. The traditional knowledge journal (TKJ) methodology empowers communities to document their traditional knowledge. Poster presentation at Knowledge ShareFair for Agricultural Development and Food Security, 20–22 January 2009. Bioversity International, Rome. Sandoval VN. 1994. Memory banking protocol: a guide for documenting indigenous knowledge associated with traditional crop varieties. In: Prain GD, CP Bagalanon, editors. Local Knowledge, Global Science and Plant Genetic Resources: Towards a Partnership. Proceedings of the International Workshop on Genetic Resources. UPWARD, Los Baños. pp.102–122. Tu, CL, Naming M, Jovita ER. 2010. Sarawak’s experience – documenting traditional knowledge of useful plants among Sarawak’s indigenous communities. In: Manurung R, Abdullah ZC, Ahmad FB, Kuek C, editors. Biodiversity- Biotechnology: Gateway to Discoveries, Sustainable Utilization and Wealth Creation. Proceedings of the International Symposium, Kuching Sarawak, Malaysia, 19–21 November 2008. Sarawak Biodiversity Centre (SBC), Kuching, Malaysia. pp.112–116.